CNET has launched a new site dedicated to video clips for everything from news to reviews. Anyone familiar with CNET knows that they are no stranger to video. Nearly every product review is accompanied with a short video review. CNET decided to take this familiarity with video and sprout an entirely new site. 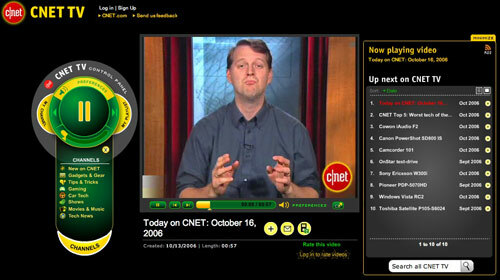 As with all CNET ventures, CNET TV is new user friendly. Videos have RSS feeds and users have the ability to download videos to their iPod. Currently the site is divided up into several channels: News on CNET, Gadgets & Gear, Tips & Tricks, Gaming, Car Tech, Shows, Movies & Music and Tech News. Each channel has a playlist of many clips, each averaging a couple of minutes in length. I commend CNET for taking the initiative to create a site like this. Bringing video and TV to the web is inevitable and large media corporations are embracing is, such as CNN with their Pipeline. However, in some aspects CNET TV is just a glorified video podcast site and does not fully immerse the user as watching a TV does. Maybe they should have just named it CNET Vidcasts?